A Central American child who is traveling with a caravan of migrants, peers from a bus carrying the group to the U.S. border in Tijuana, Mexico, April 29, 2018. 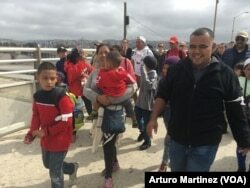 After traveling through Mexico with great fanfare for a month under the Trump administration's watchful eye, nearly 200 Central American migrants attempting to seek asylum in the United States were stopped in their tracks when border inspectors said that a crossing facility didn't have enough space to accommodate them. Trump vowed last week to "stop'' the caravan while Cabinet members said they would deliver a swift response. The asylum seekers held firm, setting up a possible showdown. 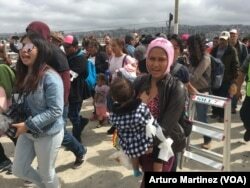 After a final briefing from lawyers and minutes before they were to begin a short walk to the border crossing, U.S. Customs and Border Protection Commissioner Kevin McAleenan announced that the San Ysidro border crossing, the nation's busiest, had "reached capacity'' for people without legal documents and that asylum-seekers may need to wait in Mexico temporarily. Trump has commented frequently on the caravan since it started in Mexico on March 25 near the Guatemala border and headed north to Tijuana. His broadsides came as his administration vowed to end what officials call "legal loopholes'' and "catch-and-release'' policies that allow people requesting asylum to be released from custody into the U.S. while their claims make their way through the courts, which can take years. Attorney General Jeff Sessions has called the caravan "a deliberate attempt to undermine our laws and overwhelm our system.'' Homeland Security Secretary Kirstjen Nielsen said asylum claims will be resolved "efficiently and expeditiously'' and warned that anyone making false claims could be prosecuted. "All I want is a place where I can work and raise my son,'' the 36-year-old said. 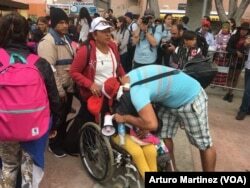 "Fighting on is worth it,'' she said as she camped out for chilly night outside the border crossing.